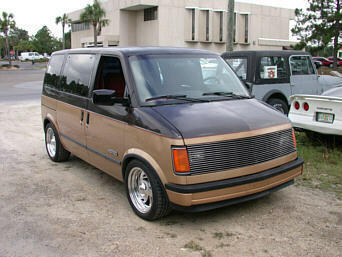 The purpose of this site is to provide information about my old project: V8 conversion and customization of my 1987 Astro minivan. The orginal page began on November 14, 1999, the day I decided to look for an Astro to modify. This van is no longer in my possession but I have left these pages up for your benefit. These pages contain info about my now sold V8 Astro van. It had a ZZ3 Crate motor modded with AFR heads and more. Some links may no longer work. Sorry. You can find out more about V8 conversions to Astro and Safari minivans at www.astrosafari.com. High Res Exhaust photos NEW! Photos of bodywork - NEW! Phantom Billet Grille install - NEW!